Published: Sept. 30, 2018 at 09:28 p.m.
Oakland Raiders running back Marshawn Lynch rushes for a 52-yard gain on a huge run play. Published: Sept. 23, 2018 at 07:47 p.m.
Oakland Raiders running back Marshawn Lynch goes airborne for a touchdown against the Miami Dolphins in Week 3. 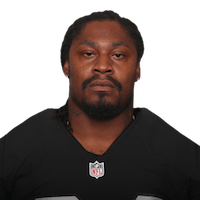 Published: Sept. 16, 2018 at 05:58 p.m.
Oakland Raiders running back Marshawn Lynch rushes 1 yard for a touchdown. Published: Sept. 11, 2018 at 02:20 a.m.
Oakland Raiders running back Marshawn Lynch powers his way through the Los Angeles Rams defense for a 10-yard touchdown run in Week 1 of the 2018 NFL season.